The first time I witnessed kitesurfing was in Dos Palmas, Palawan. Second time was in Baler, Aurora. And from then on I was awed by this extreme sport! 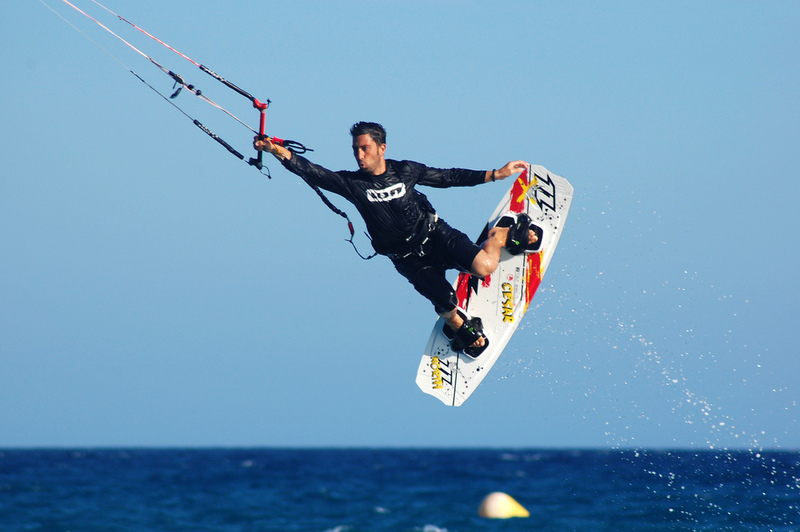 While in Naga City and CamSur Watersports Complex in Pili, Camarines Sur, foreigners have been talking about kite surfing in Bagasbas. and out of curiosity, I went to Bagasbas Beach.. There are 2 well-known tourist spots in Camarines Norte, Calaguas Island and Bagasbas Beach. Bagasbas Beach is 4 kilometers or 10 minutes away from Daet, Camarines Norte. From the town, go to the market and ride a tricycle to Bagasbas. The fare is P10.00/pax or P40.00 for the entire trip. From Manila, ride a bus going to Daet in Cubao (preferably DLTB, near Superlines). The travel time is 8-9 hours depending on the traffic in San Pablo and Sariaya. Fare in aircon bus is around P400.00. There are so many activities/adventures that you can do while you are in Bagasbas such as kitesurfing, surfing, paragliding and sunrise viewing. But the primary reason why foreigners go to this place is kitesurfing. Kitesurfing or kiteboarding is a surface water sport combining aspects of wakeboarding, windsurfing, surfing, paragliding, and gymnastics into one extreme sport. The wind and the waves are so strong that Bagasbas is best-suited for surfing and kitesurfing. People frolic while they enjoy the early morning surge of waves in the beach. You need a professional instructor for this. There are plenty of lodging houses and hotels in the area. You can even stay in Daet. But one of the best hotels is the Bagasbas Lighthoouse. It's More Fun in Bagasbas! Calaguas Island is a paradise! From Buendia, Cubao or Pasay, ride a bus (preferably DLTB, Superlines) going either to Daet or Naga City. Travel time is 8-9 hours depending on the traffic in San Pablo City and Sariaya. Fare is around P513.00 (ordinary aircon) or P650 (Executive class). You have two options were to alight. Option 1 - Daet - Take the van going to Paracale. The terminal of the van is in the Daet market near the church and the cost is P180.00. Travel time is approximately 1 hour. From Naga City (in case you opted using the plane) or in case you are coming from CamSur Watersports Complex (CWC), go to LCC Mall terminal for the van going to Daet. From Naga City to Daet is 2 hours and the fare is P180.00. First trip is 5 am and the last trip to Date is 8 pm. Then reaching Daet, take the van going to Paracale. Travel time to the port is 1 hour. Better choice is the Paracale Port. After 1 hour and 30 minutes, we reached Mahabang Buhangin, Calaguas Island. There are cottages available at the beach. Only halo-halo and several beverages are sold at the island. So it's better to bring your own food. You can also do camping in the beach. Make sure you bring your own tents and/or sleeping bags. But you can also rent for P200-300. Entrance fee is P120-150. Cottages are a bit expensive. There are public toilets available. Fee is P10-20. There are so many things you can do at Mahabang Buhangin like playing beach volleyball. You can also trek the hills and the nearby barangay. Or go to Tinago Island (other side of Calaguas Island) by foot and the trek time is 20 minutes. 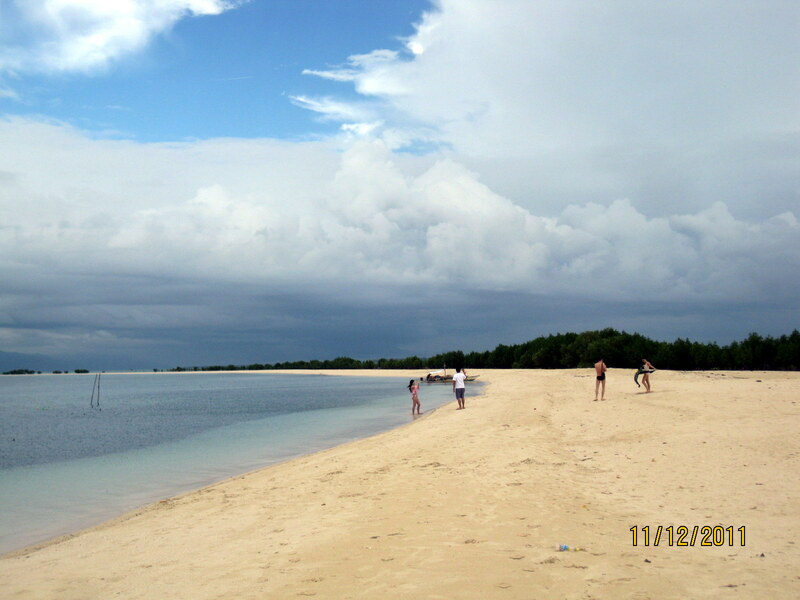 But the best thing to do is island hopping at the nearby islands. The sea is a little bit rough and you will certainly get the additional adventure you want while island hopping. In case of island hopping, you can go to 4-5 islands depending on your agreement with the owner of the boat. Water is clearer in Makulabo Island. Enjoy the island hopping experience! It's Really More Fun in Calaguas Island! There are so many ways to go to this paradise resort in Camarines Sur. From Manila, take a bus in Cubao (preferably DLTB, near Superlines) going to Naga City, Bicol. Travel time is 9-10 hours. Once you are in Naga City, go to SM Naga City terminal of Sabang and board a van going to Sabang Port. Travel time is 4 hours and the fare is P300. The terminal of the bus is in Naga bus terminal near SM Naga. You can choose from several resorts in Caramoan. Along the way, you can drop by at the Caramoan church. The best resort/place is the Gota Village Resort. The other option is to go to Paniman beach. There are two beachfront resorts (aside from the other small resorts and the homestay at Paniman). In case you want a simple habal-habal tour, cost is P300. From the port to Gota, travel time is 30 minutes. From the port to Paniman, travel time is 45 minutes. The best white-sand beaches are found in the islands of Caramoan. It is a must that you have to do island hopping. The island hopping covers Mother of Peace, Bag-ing Island,Cotivas Island, Manlawe sandbar, and Sabitanlaya Island. In case you want to go to San Andres, Catanduanes, you can hire a small boat for P1,500 or a big boat for P2,500 - P3,000. Boat ride to Catanduanes is 1.5 hours. It's More Fun in Caramoan! The Philippines is blessed with islands and islets and that is the reason why one of the adventures tourists love doing in the Philippines is island hopping! Having traveled almost all the provinces in the Philippines (4 more remains to be explored), I am sharing my pick on the top 5 island destinations for island hopping. El Nido has always been my favorite. It is a protected marine reserve. It has the Snake Island, Small Lagoon, Helicopter island, White sandbars, and the Big Lagoon. The water is so crystal-clear, it is best for snorkeling and scuba diving. Simlpy amazing! Coron offers the variety of nature tripping experience you will simply love and adore. 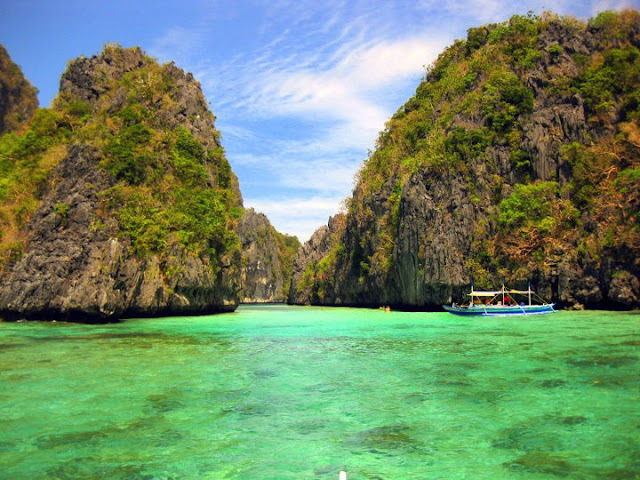 It has the Kayangan Lake, Barracuda Lake, Banol Beach, Twin Lagoons, and the Skeleton Shipwreck. You can also go to Malcapuya Island. The Survivor series was shot in these islands. That's all! 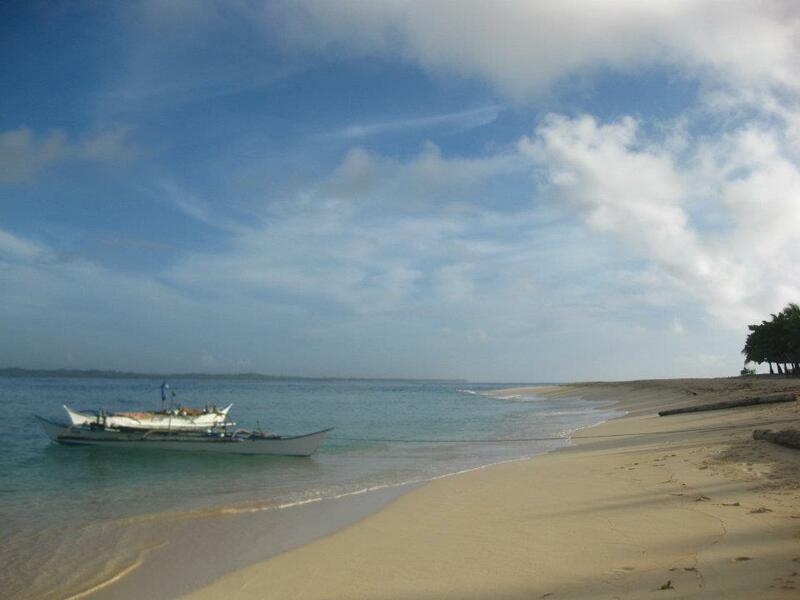 Aside from Siargao Island itself, you can explore namely - Dako Island, Guyam Island and Naked Island. And even go farther to Bucas Grande Island. Honda Bay is the nearest island hopping tour in Palawan. It has various islands to go to and all the islands have white-sand beaches. I won't miss doing my annual visita iglesia. I had to stop my tour for one day and focus on my visita iglesia in Camarines Sur. I was on Day 9 of my tour (it's actually a 14-day tour). My year won't be complete without asking for forgiveness, repenting and extending my heartfelt gratitude for all the blessings HE has given to me.